New - Just taking up the game. Never had lessons. Intermediate - Play occasionally. Want to get more experience & playing time. Advanced - Play regularly. Want to fine tune your game or work on a specific area. 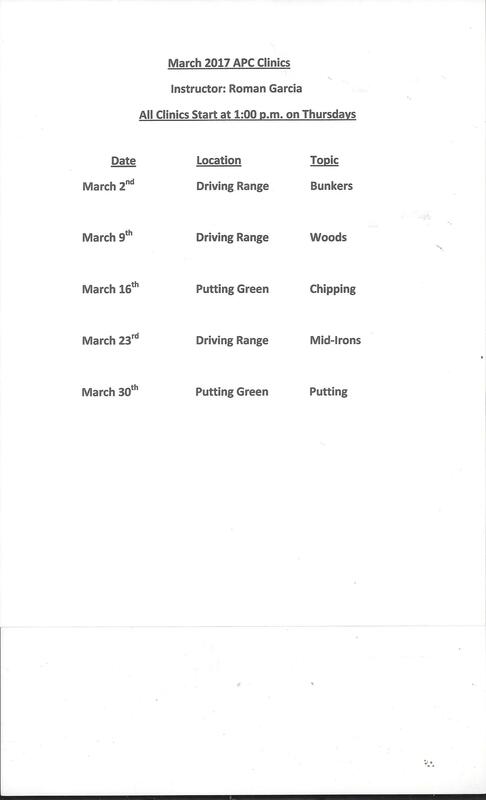 Clinic times, topics, and instructors are subject to change due to increases in membership, enrollment, and clinic attendance. CLINICS WILL START PROMPTLY AS SCHEDULED, SO PLEASE ARRIVE A FEW MINUTES EARLY. ALL PDP MEMBERS ARE INVITED TO ATTEND. PLEASE PRESENT YOUR PDP CARD UPON ARRIVAL.